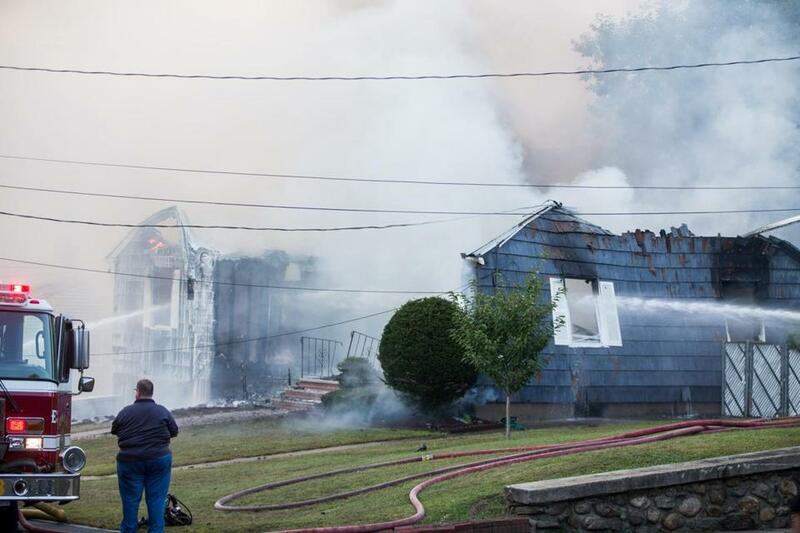 Firefighters battled a blaze in Lawrence after an outbreak of fires on Thursday, Sept. 13. Federal investigators on Thursday said Columbia Gas of Massachusetts failed to relocate an underground pressure sensor from an abandoned pipe during construction work in Lawrence in September, triggering a gush of gas into the local network that erupted into explosions and fires that rocked the Merrimack Valley. The construction work involved replacing aging pipes in the area with plastic lines. But the National Transportation Safety Board said the utility failed to tell the construction crew about disconnecting or relocating the sensor, allowing the device to detect a drop-off in pressure in the abandoned line and signal to a nearby control station to increase the flow of gas into the system. That elevated gas pressure to dangerously high levels, overwhelming the system and setting off fires across Lawrence, North Andover, and Andover. 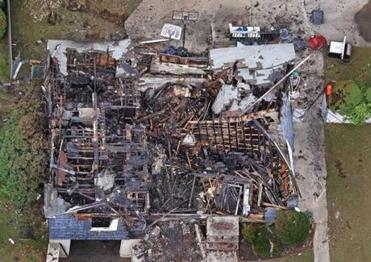 Five homes exploded and 125 structures were damaged by fire. One person was killed when a collapsing chimney fell on him, and two dozen others were injured. The preliminary report by the NTSB said Columbia was responsible for the construction plans for the work crew and had an inspector at the job site, at the intersection of South Union and Salem streets. Industry analysts said the report also raises concerns about safety protocols during the replacement of gas pipelines, and whether an inspector or a contractor involved in such work should have known enough to check the sensors. The preliminary findings on the Sept. 13 explosions and fires, which hit Lawrence, Andover, and North Andover, were released Thursday by the National Transportation Safety Board. Since the Sept. 13 disaster, Columbia Gas has upgraded its policies and procedures related to this type of pipe replacement work. And on Thursday, the state Department of Public Utilities, which regulates the industry, mandated new safety protocols for Columbia and other local utilities to guard against overpressure situations. The companies were ordered to cease all work involving connections between high- and low-pressure systems to review their procedures, and take additional steps, such as verifying the location of sensing equipment during construction. Columbia Gas said in a statement following the NTSB report that it could not speculate or comment on the final cause of the disaster, because the investigation is ongoing. But the utility noted it suspended all similar work and enhanced procedures for work on low-pressure systems after the disaster occurred. “We saw these as responsible steps to take in the aftermath of the incident and while the facts were being gathered,” Joe Hamrock, chief executive of NiSource Inc., the utility’s parent company, said. The NTSB report did not name the Columbia Gas contractor in its report, but the Dorchester-based Feeney Brothers has previously acknowledged it was working at the Lawrence site that day. Feeney Bros. denied any culpability, saying it was carrying out Columbia’s designs. “All of Feeney Brothers’ work was done with Columbia Gas’ oversight and according to written procedures provided to our crew by Columbia Gas, as confirmed” by the NTSB report, the company said in a statement Thursday. Senator Edward J. Markey, who has pushed Columbia for more explanation of the Lawrence disaster, said the NTSB report raises more questions than it answers. “For the most part, the report is not telling us anything that local residents don’t already know. They know that Columbia Gas company did not respond quickly enough. What we don’t know is how could the catastrophe have occurred. Could it have been prevented?” he said. The work involved the replacement of a cast-iron, low-pressure distribution system that was installed in the early 1900s. Gas pressure to the affected area was controlled by 14 regulator stations. The NTSB report lays out the immediate sequence of events of Sept. 13. At 4:04 p.m., a Columbia Gas monitoring center in Columbus, Ohio, received the first of two alarms indicating high pressure in the Lawrence system; the second came a minute later. However, the monitoring center had no ability to remotely control the pressure valves, which required manual work. A controller in Ohio instead reported the alarms to local Columbia Gas officials in Lawrence at 4:06 p.m. The first 911 call by a resident in Lawrence was at 4:11 p.m. The regulator station at issue was shut down by 4:30 p.m. And the critical valves for the distribution network were shut off by 7:24 p.m.
By midnight, crews began to shut off meters at individual homes and businesses, to isolate them from the distribution system. All meters were shut off by the following morning. McDonald, the industry analyst, said he expects the final NTSB report will look at the official cause of the disaster, but also reflect on state policies and protocol, as well as the state of an aging gas distribution system, among the oldest in the country. The disaster has left thousands of homes and businesses without gas heat or hot water as cold weather arrives, while Columbia Gas races to replace 45 miles of pipeline that were damaged by the over-pressurization. The company, which tapped retired Navy Seabee commander Joseph Albanese to lead the response effort, has said it is far ahead of a Nov. 19 deadline it set to replace the pipeline. But the effort has been complicated by the need to replace gas appliances and meters in many homes. Albanese has said that no property will be reconnected until it is deemed “house ready,” with safely connected appliances. That effort has moved more slowly, though officials are optimistic about hitting the Nov. 19 deadline. Columbia has said it will reimburse residents and businesses for all expenses and incurred losses. By Thursday, more than 3,000 people had been placed in temporary housing, such as hotels, apartments, and trailers. “We are working to restore gas service as quickly as possible and are committed to taking the steps needed to re-earn the trust of our customers, communities, and public officials,” Hamrock, the company executive, said in a statement. Paul Oleksa, a pipeline safety consultant based in Ohio, said the NTSB report leaves open many questions about the incident. But he said the response plan was impressive. @globe.com. Follow him on Twitter @miltonvalencia. Matt Rocheleau can be reached at matthew.rocheleau@globe.com. Follow him on Twitter @mrochele Shelley Murphy can be reached at shmurphy@globe.com. Follow her on Twitter @shelleymurph.